Mr. Freeze - Berry Frost 100mLAssorted berries consisting of strawberries, blackberries, and blueber..
Mr. Freeze - Apple Frost 100mLTangy crisp green apple with a cooling menthol finish. Available ..
Mr. Freeze - Strawberry Banana Frost 100mLSweet strawberries blended with creamy bananas and f..
Mr. Custard - Lemon Cake Custard 100mLLemon Cake combines a moist, zesty, citrus packed lemon cake w..
Mr. Custard - Strawberry Vanilla Custard 100mLStrawberry Vanilla takes a creamy, dreamy, soothing cu..
Mr. Custard - Cinnamon Custard 100mLCinnamon Custard takes that smooth, soothing, sophisticated cust..
Mr. Freeze SALT - Pure Ice 30mLAvailable in a 30mL bottle in 35mg & 50mg nicotine levels.This fl..
Mr. Freeze SALT - Peach Frost 30mLAvailable in a 30mL bottle in 35mg & 50mg nicotine levels.This..
Mr. Freeze SALT - Strawberry Lemonade Frost 30mLAvailable in a 30mL bottle in 35mg & 50mg nicoti..
Mr. Freeze SALT - Blue Raspberry 30mLAvailable in a 30mL bottle in 35mg & 50mg nicotine levels.T..
Mr. Freeze SALT - Strawberry Lemonade 30mLAvailable in a 30mL bottle in 35mg & 50mg nicotine lev..
Mr. Freeze SALT - Strawberry Watermelon Frost 30mLAvailable in a 30mL bottle in 35mg & 50mg nico..
Mr. Freeze - Strawberry Lemonade 100mLA twist you cannot resist! Sweet with citrus treat i..
Mr. Freeze - Watermelon Frost 100mLThe sweet and juicy blend of strawberry and watermelon will give ..
Mr. Freeze - Peach Frost 100mL A delicious fruity feast you will definitely enjoy above the lim..
Mr. Freeze - Strawberry Watermelon Frost 100mLRelive the beauty of summer with a refreshing vibe fro..
Mr. Freeze - Strawberry Lemonade Frost 100mLThe sweet and citrus combination will capture your sense..
Mr. Freeze - Pure Ice 100mLRelax and enjoy a refreshing treat from Mr. Freeze. The cool and light&nb..
Mr. Fruit - Blue Raspberry 100mLA bold taste of delicious blue raspberry. 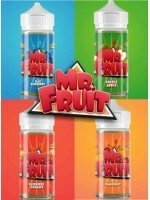 Mr. Fruit recreates your f..
Mr. Fruit - Double Apple 100mLDouble Apple by Mr. Fruit E-Liquid is a direct replica of freshly pick..
Mr. Fruit - Raspberry Lemonade 100mLSlight sweet and slightly tart, Raspberry Lemonade by Mr. Fruit ..